Possibilitarian Garden: What is Permaculture, Anyway? The article below, "What is Permaculture, Anyway?" was originally published in Permaculture Design magazine in the #98 Decolonizing Permaculture issue of Winter 2015. For a hardcopy of the issue, more info can be found here. What is “permaculture,” anyway? Maybe you hear people talking about it all the time, and still have no idea what it is. Maybe someone loosely recommended to you that you check it out, because it might interest you. Maybe picking up this magazine is the first time you are seeing the word. Whatever the case that brought you to this point, I can assure you that there is something in permaculture for you. I can also assure you that even for many permaculture practitioners, it can be challenging to pin down in a quick ‘elevator speech’ what exactly permaculture is. Some say it’s a movement, some say it’s a bunch of growing methods, some say its philosophy. In this article, we will be focusing on permaculture as a design system. During my Permaculture Teacher training course, our teachers challenged us to take five minutes to come up with a definition for ‘permaculture.’ Some people came up with it quick - some needed more time – overall, the variety of definitions people offered painted a colorful array of nuances and subtleties building upon what permaculture is. Hopefully, this article will leave you with a clearer sense of what is permaculture, with ways in which you may be able to take your next steps on your journey. First, let me break the word “permaculture” down for you. “Perma” – “Culture”. Perma, short for “permanent.” -Culture short for “agriculture,” and also “culture.” So you can think of “permaculture” as simply “permanent agriculture” and “permanent culture.” The term was coined and popularized in mid 1970’s by two Austrailian ecologist, Bill Mollison1 and his young student, David Holmgren2; it is now a term understood on a global scale. Calendula seeds ready for saving or self-seeding. Contrary to what our current digitized-technological and mechanized culture may present at times, humans are a people reliant on caring for the land and for each other. Our ability to survive rests wholly on plants’ ability to capture the sun’s energy and translate it into a form useable to us through photosynthesis. From the land we create our food, shelter, water, and clothing. And also culture. Traditionally, human cultures centered on the seasonal rhythms and cycles of the earth. Seeing as how much of the world has grown alienated and disconnected from our intimate relationship with the earth, permaculture looks to re-center our systems (be it food, economic, political, etc) in the flow of energy and cycles of nature. As we face such extreme global catastrophe- be it climate change, war, hunger, or one of the many extinctions we are currently experiencing- we are faced with the reality that if human societies do not change course we will perish, and the earth will continue to adapt and go on without us. Therefore, the more we work with the earth, learn from her natural cycles, and model our systems based on the nature’s ecological models of adaptability and resiliency, we have a significantly greater chance at weathering the storm to create a permanent and resilient culture. Permaculture proposes this approach. Permaculture is a holistic, ecological design system that can be applied to everything from urban planning to rural land design to economic systems to social structures and everything in between. It is not only one set of practices, or philosophy, it is a way of integrated thinking. It is a system of integrated design principles that work to harness, utilize, and work with nature’s energy. This ecological way of viewing and working with the world sees things as a complex web, rather than a complicated series of segregated events. This design system can produce a paradigm shift that may be comforting and inspiring to those who feel like they are constantly putting energy into a system (whether its their home garden, farm, political, social, or economic work) that just does not seem to change or offer much as a benefit or yield. Permaculture is a way of designing the world we want to live in that cares for the earth and people so that all needs are met in an equitable way. Permaculture design is abundant system thinking, and prevents the constant banging of one’s head against the wall when faced with constant scarcity. Because the point is that by working with rather than working against natural forces, one can maximize inputs and harvest maximum outputs. It is a simple term, yet as an integrated system it has many facets in which it can be applied, depending on one’s focus. The key is that anything can be viewed through a permaculture design lens. 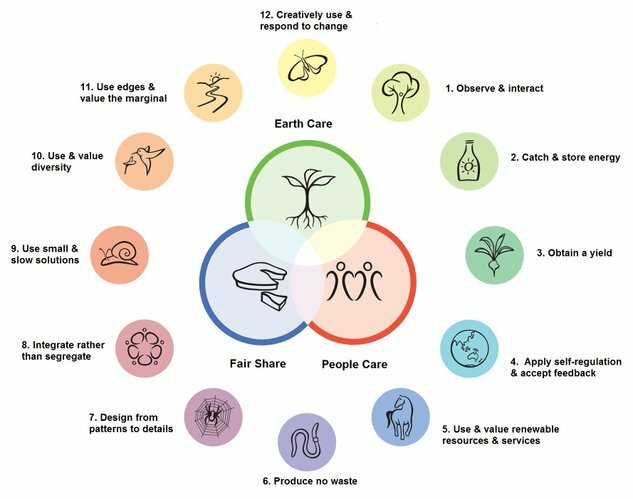 As an integrated design system, permaculture incorporates numerous disciplines of study and practice. These disciplines are presented in a Permaculture Design Course (PDC) resulting in a certification as a Permaculture Designer3. 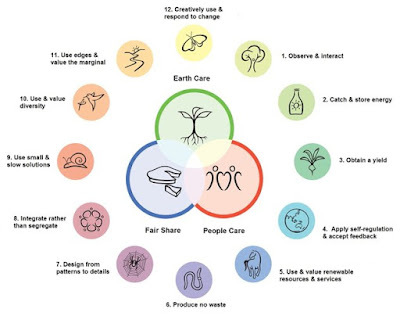 Because of the numerous systems in which these design principles can be applied, the PDC covers a sort of introductory ‘buffet’ to permaculture design topics that emphasize Permaculture’s core ethics: Earth Care, People Care & Fair Share. Considering any one of these topics warrants a life study, there are numerous entry points into using permaculture as a way to design resilient systems. A PDC is a way to look at an expansive array of topics through a new lens. Permaculture marries indigenous ways of knowing with regenerative agriculture, modern green infrastructure and progressive socio-politico-economic structures. Permaculture is a process of looking at the whole, seeing what the connections are between the different parts, and assessing how those connections can be changed4 so that relationships function more harmoniously. 2. Attend a PDC, read everything you can about permaculture, listen to permaculture podcasts, go visit working permaculture sites. A PDC can be like a trip down a rabbit hole that leaves the sojourner wanting more at the end. It is one of the best ways to get significant exposure to what’s possible with permaculture. Studying permaculture through reading writers7 will support you in gaining more clarity of what you may want to dive deeper into. And yet, for many, simply spending time in a place that is a thriving permaculture model can lead to tremendous shifts. 3. Find what interests you most and work from your niche. Evaluate what are you good at? What existing assets and resources are already present, and use that as your starting point. What are you interested in? How does that overlap with the needs of your community? From there, take the smallest steps possible to make the biggest impact to enhance the existing systems. Maybe that means meeting your neighbors, planting perennial onions, or saving seeds to plant out the next year, or collecting rainwater off your roof, or getting involved with or starting a food cooperative, or building a humanure composting system on your property, or simply recording patterns where you are working for a year or more. Whatever your entry point, make sure to take a step back and observe the social, biological, and economical ecosystem and listen for feedback before taking next actions. That is our civic duty as residents and stewards of this earth and of our communities: listen and accept feedback. As one of my permaculture teachers, Peter Bane, tossed out in a PDC class one day while reflecting on the long extinct ancient Viking culture, “it’s better to adapt than die.” I will add to that, better than not dying is thriving! And I think permaculture design principles and ethics present just that – an opportunity to rethink our current social, political, economic, and agricultural systems with new eyes embracing the potential transformation to thriving whole communities of abundance. 1 Mollison, Bill. Permaculture: A Designer’s Manual. 2 Holmgren, David. Permaculture: Principles and Pathways Beyond Sustainability. 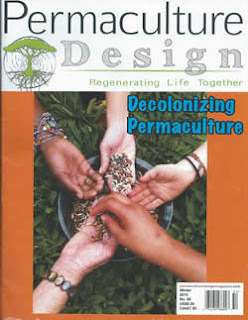 3 One can learn more about the standardization of PDC certification and accreditation at Permaculture Institute of North America’s website: pina.in Also, look in the back of Permaculture Design magazine for listings of upcoming PDC courses. 4 Whitefield, Patrick. What is Permaculture. 6A few social permaculture resources: The Black Permaculture Network and Pandora Tomas’ work, People & Permaculture by Looby McNamara, Karryn Olson-Rammanujan’s “Pattern Language for Women,” Permaculture City by Toby Hemmingway, The Empowerment Manual: A Guide for Collaborative Groups by Starhawk, Adam Brock’s work with Invisible Structures (http://www.peoplepattern.org). 7See the book catalogue insert included in the magazine for great resources. 8 see “David Holmgren on Permaculture: An Interview,” The Permaculture Podcast with Scott Mann, April 4, 2013.